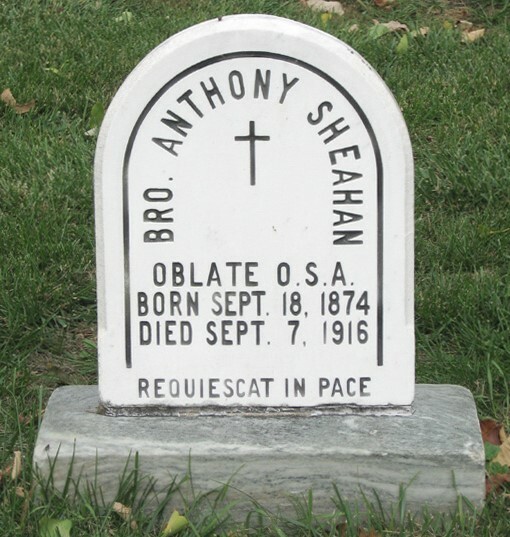 Francis Patrick Sheahan was born in Philadelphia, Pennsylvania, to Patrick Sheahan and Bridget Hogan, on September 18, 1874, and was baptized nine days later at St. Philip Neri Church, Philadelphia. He attended Saint Joseph Parochial School and the Spring Garden Institute, where he studied architectural drawing. He applied to the Order as a lay brother, and was vested at Villanova on December 13, 1913, with the name Brother Antony. Brother Antony is buried in the Community Cemetery at Villanova. Newer PostWilliam F. Sheedy, O.S.A. Older Post Thomas J. Shea, O.S.A.